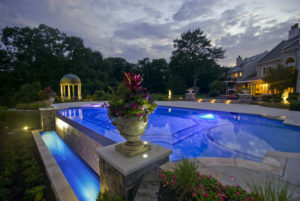 Cipriano Landscape Design & Custom Swimming Pool’s award-winning custom swimming pools and landscapes are a relaxing oasis by day and an elegantly entertaining hot-spot by night. With the use of fiber optic in-floor pool lighting, watch in amazement as your very own antique-style pool and spa transform into an aquatic dance floor, “reflecting” a starry night-sky. 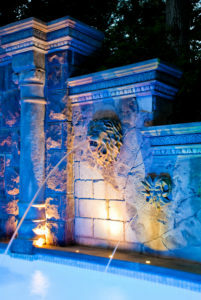 Around your inground pool, fiber optic deck jet fountains can be used as accents creating a flashy fountain effect that brings energy and motion to your backyard nightlife. Volcanic fire-pits nestled alongside luxury pool designs illuminate and ignite backyards with a dynamic sense of awe and wonder that only fire can evoke, perfect for late-night gatherings. Don’t allow the setting sun to put an end to the depth and character of your backyard or swimming pool. With LED, fiber optic and landscape night lighting, your new outdoor living area can be enhanced at night and enjoyed as long as you want the entertainment to last. Outdoor lighting provides functional usage to custom natural stone patios and outdoor kitchens and grills; lighting also provides a safe environment to entertain poolside well into the night. Outdoor fireplaces emit light and warmth to combat the night’s cool air, acting as a warming retreat for friends and family. A full, diverse landscape accented by strategically placed outdoor lighting contributes to a secluded, yet lively ambience. Whether a romantic night-out for two or an all-night social soiree, Cipriano’s custom landscaping and swimming pools make “going out” a lot easier simply open your backdoor! The award-winning pool and spa is on display from sunset to sunrise with night lighting from LED colored pool lights, a volcanic fire-pit, and fiber optic lighting surrounding the swimming pool and waterfall. Colored LED lighting in the pool and waterfall allows the water to truly shine when the sun begins to set. The waterfall is enhanced with fiber optic lighting as water cascades over the rocks in a glistening white mist. The volcanic fire-pit on the edge of the swimming pool naturally emits a fiery glow highlighting the small rock cave in which it sits. Night lighting also accents the rocky terrain and larger trees surrounding the pool to bring the entire natural backyard paradise to life throughout the night. As the sun begins to set, Laminar deck jets elegantly arch over the walkway to illuminate the path below with an effect that only water can produce. As the spillover from the fountain reaches the strategically lit basins of water below, a mystical glow appears in the water that can only be achieved at nighttime. 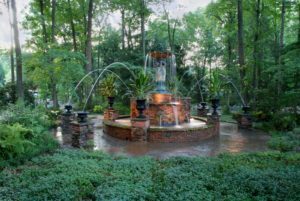 The upward lighting of the fountain makes the water feature a focal point of the night, inviting friends and family to gather around and retreat within the extravagantly, natural landscape design. 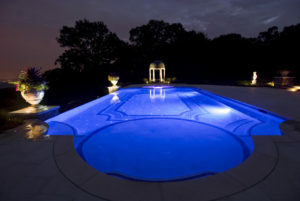 Deep into the night, WaterColors LED energy-efficient pool and spa lights shimmer in the custom vanishing edge swimming pool and help to illuminate the entire back patio in a mysterious aura of blue. Fiber optic lights also highlight the iridescent glass tile on the pool floor and allow the swimming pool and spa to shine all night long. Landscape night lighting accentuates the gazebo area, two potted plants surrounding the infinity edge, and the various sculptures found amidst the landscape. The subtle accents truly emphasize the focal points of the backyard nightlife. 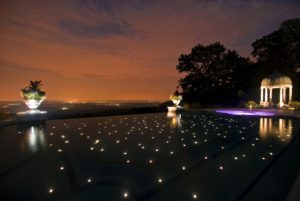 In-floor fiber optic lighting for the swimming pool and spa gives the backyard a skyline of its own. Four colorful Laminar deck jet streams at each corner of the swimming pool spring forth to bring the New Jersey pool to life at night. The colorfully lit spa matches the jet streams bringing the whole aquatic masterpiece together. Landscape night lighting makes the antique stone gazebo extremely inviting for a view across the mountains at sunset. The elaborate fountain in Mahwah serves as a beacon of light in the darkness, illuminating the surrounding walkway using in-floor lighting and fiber-optic jet streams. Strategically placed outdoor night lighting highlights the perimeters of the structure inviting onlookers closer to enjoy and explore the fountain and its surrounding paths. Antique pots are put on display as they serve as catch basins that receive fiber-optic jet streams from overhead. The continuous motion of the fountain coupled with the night lighting gives off an inviting misty aura throughout the whole structure. With 200 in-floor fiber optic lights, the NJ swimming pool stands out at night. While the water reflects a dark night sky, the scattered in-floor fiber optic lights of the pool shine like stars in a planetarium. In contrast, the well-lit spa glows with a variety of mysterious ultra-bright colors. Night lighting the cast urns on either end of the infinity edge provides a frame for the city lights of a skyline. Even on a hazy night, the custom swimming pool and spa do not fail to light up an evening. The landscape architecture comes to life through LED colored pool lighting that allows the unique glass tile designs to be seen even at night. A fire-pit and gas-lit tiki torches provide constant warmth and energy that make the back yard perfect for evening entertaining. Night lighting enhances the beauty of the landscape, creating depth by allowing specific plants to stand out from their natural backdrop. The 22-ton boulder waterfall is the focal point of the nightlife backdrop, providing constant movement and relaxing sounds. The pool and landscaping ideas for the rugged NJ project actively demonstrate the power of nature with flowing water and blazing fire. The natural waterfalls that run continuously into the swimming pool work in harmony with the poolside cave that encompasses the volcanic fire pit. A unique fire-pit brings energy and intensity to any backyard nightlife well after the sun has set. Night lighting, scattered along the rocky cliffs of the waterfall, calls attention to natural plantings, allowing them to truly stand out after dark. The colorful fiber optic pool lights at the foot of the pool’s intricate backdrop place all of the details on display as the sun begins to set. The custom sculptures and architectural detail are brought to life as the fiber optic lighting gives energy to the otherwise static, old world structure. 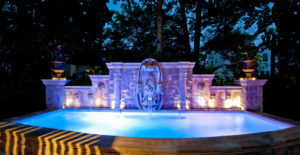 WaterColor LED energy-efficient pool and spa lights provide the finest, brightest colors for the pool by creating sharp blue water that contrasts with the color-lights shining upward against the antique stone structure. The finished product is a well-lit, exciting ambience for backyard nightlife. The fiber optic swimming pool lighting truly enhances the presentation of the focal point of the yard in all of its magnificent intricacy. 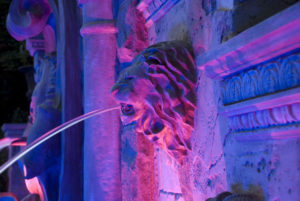 The purple light cast by the swimming pool’s fiber optic lighting shines across an elaborate structure, blending the antique style of the lion sculpture and cast architectural stone with a flashy, modern illumination. The sharp color of the fiber optic lights demonstrates the great detail of the hand-crafted sculptures even at night. 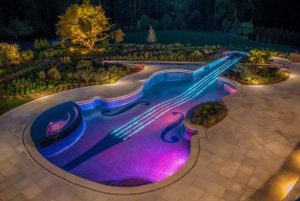 The same fiber optic lights also allow the water to take on new color throughout the night as it elegantly streams from the mouths of the sculptures gently into the swimming pool. As the sun begins to set, the Venetian plaster and stone columns in the custom swimming pool begin to shine as the entire antique backdrop comes to life. 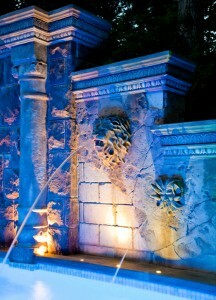 The fiber optic lights beneath the stones and sculptures shed light on the masterful detail. Satyr faces and growling lions’ heads cast menacing shadows as they spew water into the dipping pool. After sundown, the fiber optic lighting displays the impressively detailed elements of this custom swimming pool as a vision of elegance.